Finally after a year and a half countdown! Neither of us could believe it the day had arrived, we were off to board our first ever Thomas Cook flight. We were going to Walt Disney World! As a family we have been to Florida lots of times but have only ever flown Virgin Atlantic. We have also flown to the east coast of America with Virgin Atlantic. In addition I have flown to New York with BA. 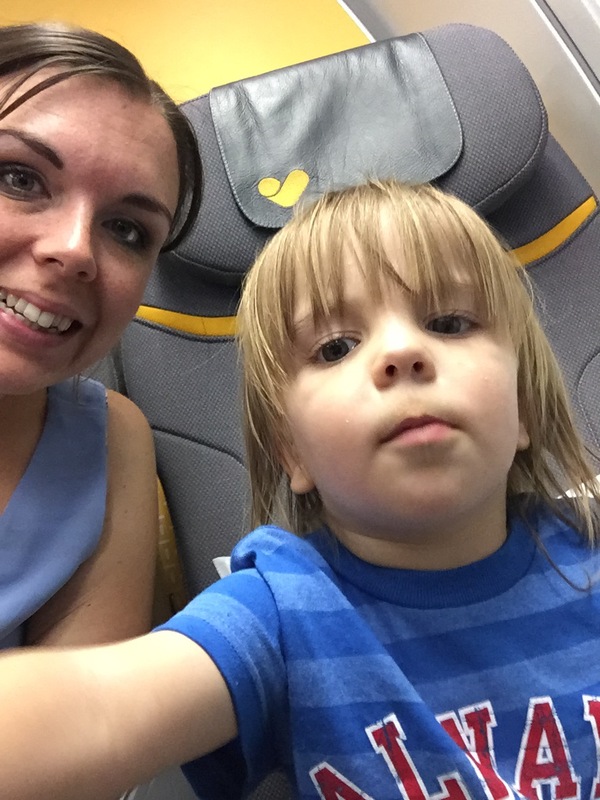 So this was our first time flying Thomas Cook airlines. I had read lots and lots of reviews of Thomas Cook, some good some bad but as the flight was cheaper than Virgin Atlantic we wanted to make up our own minds. Thats the thing with the internet, people tend to only take the time to put up bad reviews rather than good ones so when you do research things bare that in mind. We booked the flight direct with Thomas Cook website. The prices were good for travel to Orlando but not so great for the return leg so we booked each leg separately. Knowing we had an out flight booked was important to us. We also upgraded to the Premium Class cabin. The upgrade included a larger luggage allowance, more legroom, larger cabin luggage and premium menu. Just a few months after we had booked I had an email to say the time of the flight had changed. I wasn’t best pleased with this as we been persuaded to fly Thomas Cook by the fact the time pretty much matched that of Virgin Atlantic. We like to arrive in Orlando with enough time not to rush off to bed once checked in to the hotel. There was nothing I could do about it now, we just had to accept that we were now flying at 12:55 instead of 10am. So on the morning of our travel day we packed up the car and headed to Manchester Airport. We had booked parking at the airport where you pretty much park at the terminal (or just a short walk) and the company move your car whilst your gone. The massive advantage to this as parents of young children is that there is no transfer to contend with. So no bus to board, literally just unload the car onto an airport trolley and walk into the terminal. We seemed to have lots of luggage but we were taking carseats as well as a double buggy.With loaded luggage trolley we headed to the check in desk. As we were flying in the premium cabin there were dedicated check in desks with shorter queues (a massive plus when with young children!) So with little delay we checked in and were directed to the special assistance lane for wheelchair as we had a double buggy. I couldn’t see what the other security lanes were like but the one we used was minimal. I would never ever complain about the size of a security lane anyway, so long as everyone is being kept safe I’d rather just wait our turn. Unfortunately we were stopped for a bag search as the security people couldn’t identify a strange shape in our suitcases, it turned out to be the Dobble game (which by the way is a great family fun game!) The guy who did the search was really nice and soon we were on our way through to the shops and restaurants. We’d decided ahead of time we wanted to get bruch in Giraffe. Giraffe is only available in terminal 1 at Manchester airport so we were lucky that it was our terminal! We were quickly seated by the window with no wait, the boys loved it as they got to watch the aeroplanes whilst eating breakfast! The babychinnos went down well! 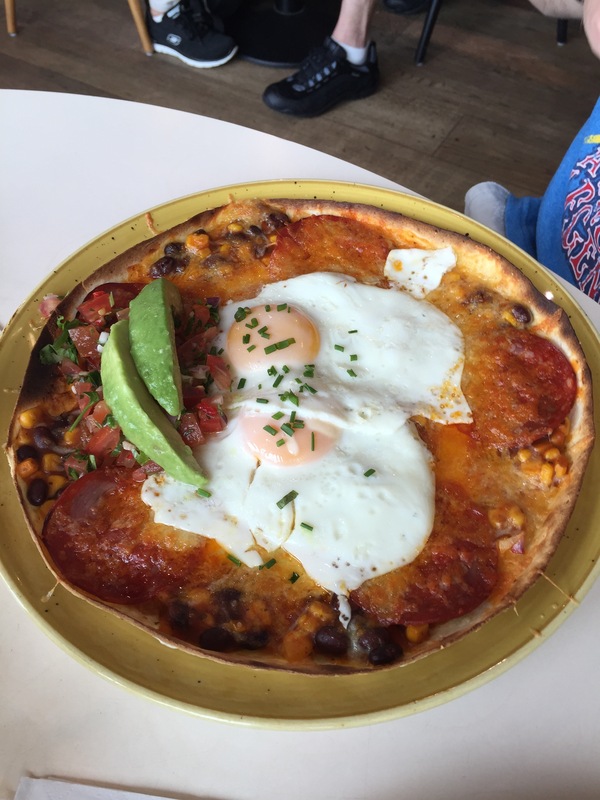 Hubby had the Huevos Rancheros which he said was really good and I had the pancake stack. We were after all heading to the land of pancake breakfasts! The pancakes were ok, I just kinda thought there might be more too them. The boys had some porridge. After breakfast we had a wander around the shops in the terminal until our gate was announced. At boarding time we went to find our gate and get settled into our seats. As we were in premium economy we were offered arrival drinks as we sat down. The boys had some orange juice. 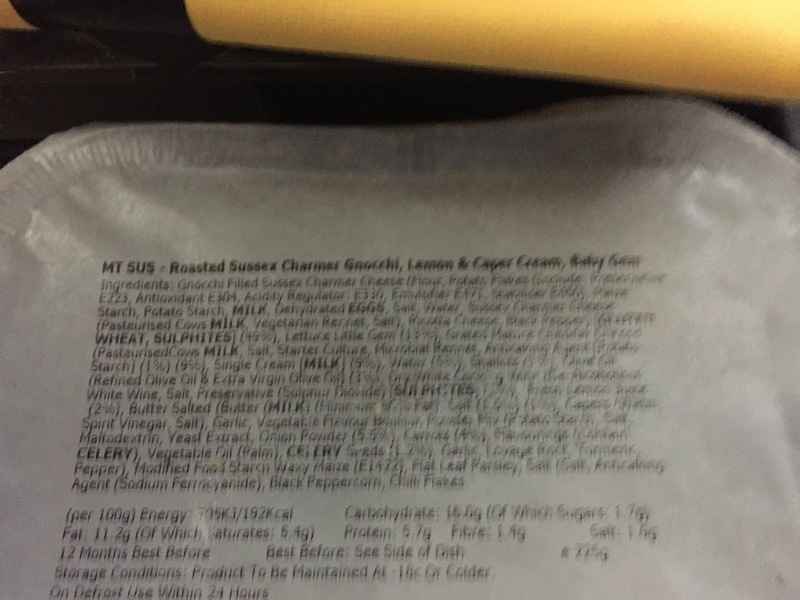 They were also impressed with the little children’s amenity pack that was on their seats too. Everyone settled into the flight and I tried to engage the smallest with some entertainment. I was impressed with the drinks service, we were on our holidays after all! I can’t remember how far into the flight it was that the meals came. The children were served first which bought me enough time before my meal to open theirs. He had meatballs and pasta, which came with cheese and crackers and a dessert. I don’t really like meat so I didn’t try the meatballs but the eldest said they were yummy! 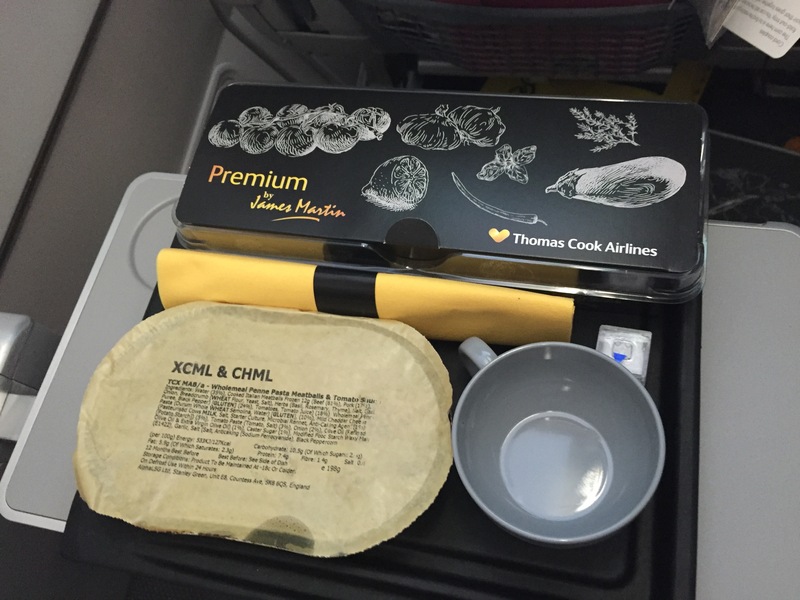 The meals in Premium class Thomas Cook airlines are designed by James Martin. James Martin is a celebrity chef famous for amongst other things Saturday kitchen. For my meal I chose the vegetarian option of Roasted Sussex Charmer Gnocchi with Lemon and Caper cream. It was by far the nicest airline meal I have every eaten. Now I need to mention at this point I’ve eaten lots of airline food and this far exceeded my expectations, which was a pleasant surprise! I enjoyed it so much I forgot to take a photograph of it open! I actually want to eat it again now that I’m writing about it. The flight from Manchester to Orlando is usually around 9 hours long. Which is a long time for little people. Thankfully the mix of entertainment on board, and toys I had brought with me was enough to keep them going (mostly!). One of my top tips for long flights with children is to go to a local pound shop and spend £5-£10 on toys. That way you can open a new toy every hour (cars, colouring etc) and just get rid of them before you leave the plane. It certainly keep my two entertained. They love getting something new every hour to play with! Sometime later we were served an ice cream to enjoy with the film. This again was amazing, really really creamy ice cream. Far exceeding my expectations for airline food. It was Raspberry ripple and Devonshire cream. The views from an aeroplane window still astound me. It is simply stunning to be able to see the clouds from above. The world really is an amazing place. A few hours again had passed and we really were getting excited to be getting closer to Orlando. So far Flixster hadn’t had a sleep. I could tell he was getting tired but is not one for napping! Just as he was starting to get restless the afternoon tea appeared! There were little sandwich rolls, a scone, some jam and cream. We weren’t particularly that hungry but we enjoyed it and knew that we may not eat again today so it was a welcome break in the flight. Again Thomas cook premium really was living up to its name. Just before landing we spotted this awesome thunder cloud, which I know isn’t unusual in the hot and humid climate of Florida, but it was great to see from the air! I have a love hate relationship with the sky maps on aeroplanes. On one hand I love seeing where we are in the world but on a long flight it reminds you there are sill hours to go! It was fun for the boy to be able to see how big America is though, and where we were in the world. Sure enough true to predictions as the seat belt signs were switched on for landing, this one crashed out. An early morning followed by a 9 hour flight had really taken it out of him. He slept all the way through landing and clearing customs. Thank goodness I’d brought a carrier so I wore him on my front all the way through the airport. I don’t know what I would have done without the carrier it was a god send. The only thing I would say about Thomas Cook was that when the plane had landed and the airbridge was connected there was no organisation about how to get off the plane. As there was only one door the premium and economy passengers were all pushing and shoving to get off. I don’t mind when I get off but it was like a crush to get through the door and families were getting separated. Then stopping by the other side of the door to catchup which was causing more delays. Perhaps there could be a little better organisation at exit. My experience of other airlines is that first class and premium exit first then the economy class so that people aren’t causing a crush at the door. We made our way smoothly through customs (you are not allowed to take pictures there) and waited for our baggage. The wait was quite long but it finally all our bags were there. As we were staying on Disney property we made full use of the Disney Magical Express service to get to our hotel. It meant we could just head straight to our bus without having to pick up a hire car or drive ourselves. You do have to prebook the Disney Magical Express but it is a free service! Once on the Magical express we could truly relax. We knew from that point onwards we were in the care of Disney and we were on our holidays!